This easy vegetable green curry comes together in about 20 minutes and is packed with delicious, curry flavour. It’s vegan and gluten-free, can be made low fat, pairs perfectly with brown rice, quinoa or noodles and tastes amazing with a bit of spicy kick. Add the garlic, ginger and onion to a pan with 1 tsp of coconut or a splash of water or vegetable stock. Saute until soft, about 5 minutes. Add the chili flake and green curry paste. Stir to combine and cook for a few more minutes. Add the coconut milk, soy sauce, broccoli and red pepper and simmer for 10 minutes or so. 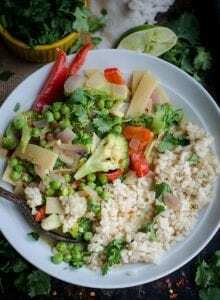 Add the bamboo shoots and peas and simmer for about another 5 minutes. Stir in the lime and coconut sugar. Serve over brown rice, quinoa, noodles or cauliflower rice, topped with fresh cilantro or Thai basil.